Shared bicycles represent the wide range of bike-share systems around the world, many of which are currently facing challenges in terms of operation and ridership. Photo courtesy of Melbourne Bike Share. 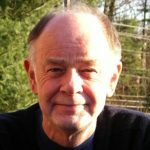 The Bike-share Report is a new blog series on bike-sharing, exclusive to TheCityFix, from Peter Midgley – the former Urban Mobility Theme Champion for the global Transport Knowledge Partnership (gTKP) with 25 years of experience at The World Bank. The first blog post in this series provided an overview of the swift, global expansion of bicycle-sharing schemes. Despite experiencing astonishing growth throughout the past decade, recent years have borne witness to a series of challenges in the world of bike-sharing. As evidenced by the closure of 82 bike-sharing systems since 2000 – including 42 in Spain alone – the global bike-sharing industry is in the interesting position of facing both enormous potential for growth and significant obstacles. So, what’s happening? Why have bike-sharing schemes failed in so many cities? How is it possible for an industry to grow so rapidly in some areas yet struggle so profoundly in others? In this installment of “The Bike-share Report,” we take a look at the challenges and opportunities in front of the global bike-sharing industry. While no two bike-sharing systems are exactly alike, there are a number of common challenges that bike-sharing systems face as they seek to gain traction within the array of mobility options in cities. For instance, a recent report on bike-sharing in Spain attributed the difficulties faced by Spanish cities in part to “lack of a critical mass, sufficient bicycles to meet demand, political will at the highest level, a good communications plan, and the development of cycling infrastructure designed to encourage cycling in the city.” While Spain’s considerable struggles with bike-sharing may be an extreme case, the themes of dwindling political and financial commitment have been echoed by other systems, particularly within Europe. Beyond systems that have closed, others are simply failing to attract users. For example, data show that Australia’s two systems in Brisbane and Melbourne are sorely underused when compared to other systems, with usage rates only 5-10% of the rates of successful bike-sharing systems elsewhere. 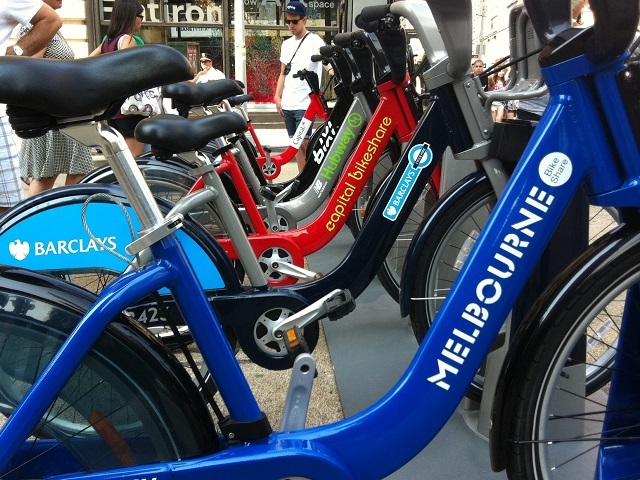 While some have suggested that compulsory helmet laws in both cities impede usage, one report suggests that the two Australian schemes lack some of the key attributes that contribute to success elsewhere – high density of bikes and stations, pricing access, convenient operating hours, and effective marketing to name a few. Another article cites major accessibility problems – including the sign-up process, helmet availability, and the location of docking stations – as well safety issues and a 10:00pm closing time with curtailing wider use of the systems. As with Spain, these problems are not all unique to Australia and reflect the need for better understanding of global best practices in bike-share planning and operation. 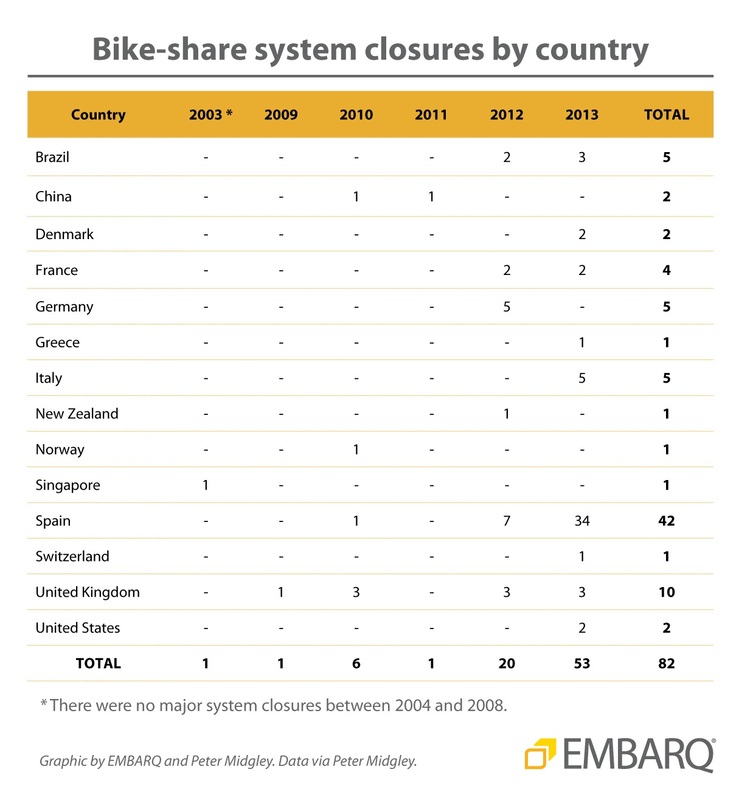 Bike-share system closure by country. EMBARQ and Peter Midgley. Finally, new maps and visualizations are helping bike-share enthusiasts earn access to information on systems from around the world. Moreover, they are helping to keep bike-sharing in the media spotlight, which in turn attracts new users and builds the beginnings of a bike-sharing culture in major cities. This attention has contributed to an increased awareness and demand worldwide, with a reported 183 cities planning or constructing new bike-sharing systems. While it is clear that there are plenty of difficulties in structuring efficient, effective, and user-friendly bike-share systems, reports of new planned systems indicate that cities are not shying away from the challenge. For these new systems to be successful, they must develop innovative approaches and draw from the lessons of current systems in order to make bike-sharing a long-term, viable, and sustainable urban mobility solution. Peter Midgley is currently the Urban Mobility Adviser for the Indonesia Infrastructure Initiative (IndII), an Australian Government funded project designed to promote economic growth in Indonesia. Between 2008 and 2010, he was the Urban Mobility Theme Champion with the global Transport Knowledge Partnership (gTKP). It was during this period that he began to monitor developments in bike-sharing and established a bike-sharing database, which he continues to update every year. Peter also drafted the background paper, “Bicycle-Sharing Schemes: Enhancing Sustainable Mobility in Urban Areas,” for UN DESA for the 19th session of the Commission on Sustainable Development in May 2011. Peter has over 40 years of experience in urban transport. He was a staff member of the World Bank for 25 years and he has supported the need to improve urban mobility throughout his career. He lives in south-west France.